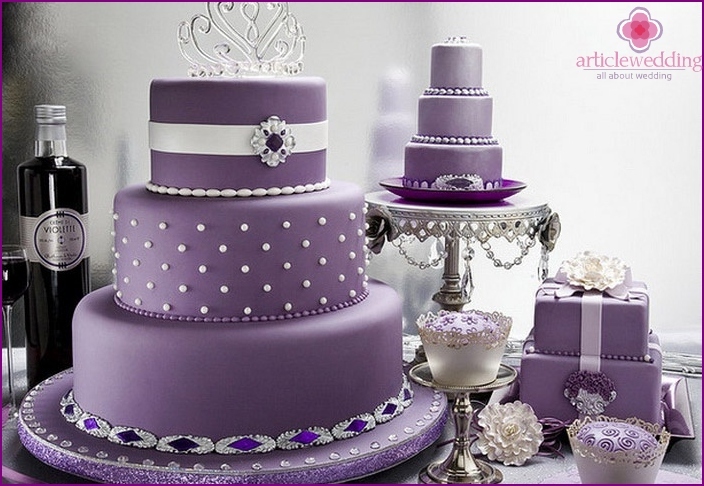 Wedding Cake - decoration and a nice additionholiday. All the guests and the couple are looking forward to the ceremonial removal, cutting and tasting dessert. 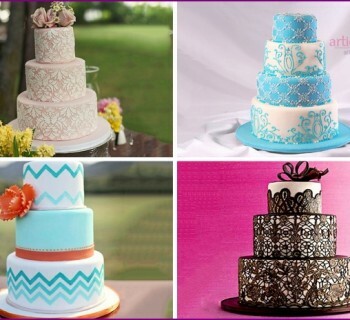 To meet these expectations, the bride and groom in the pre-wedding preparations are paying a lot of time choosing the best wedding cakes. It is necessary to find a good pastry shop with an experienced baker, to determine the design of the cake, the number of storeys and decor. An important question dessert toppings, which will be a worthy addition to the gentle Korzh, fill them with flavor and juiciness. 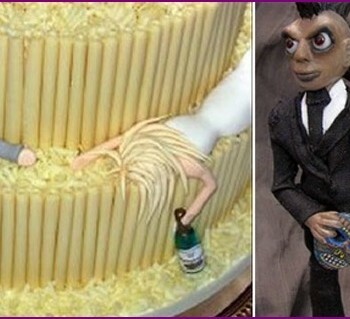 How to choose the stuffing for the wedding cake? Improperly selected filling for cake willto the complete dismay of the newlyweds and guests, so you need to carefully consider all the components of a wedding dessert. Everyone has their own taste to please all those present will not, but still choose toppings that will please the majority, we need to try. 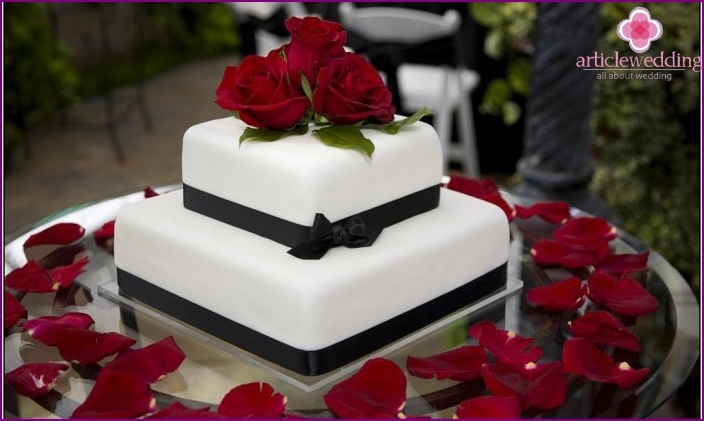 When ordering a wedding cake, keep in mind that it will try to the end of the holiday after a heavy meal. Therefore, the filling should be as light and less caloric. Eat dessert wedding impregnated densebutter cream, few people can, because he is too fat and saturated. Avoid cakes with fat creams in favor of lightweight options. Most couples for their wedding buffet to choose cakes biscuit shortcakes or yogurt base that blends well with fresh berries and fruits. Like many wedding cakes with a layer of a souffle, berry jelly, low-fat whipped cream, the cream of the cream cheese. 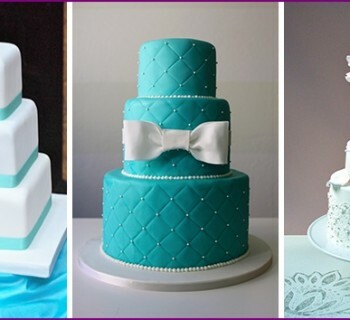 Sponge cakes - ideal forwedding cake. Light air mass, supplemented by a delicate cream will not leave anyone indifferent. Biscuit dough less fat compared with other types of baking, so it is traditionally used as a basis for the wedding dessert. Do you want to make a cake even less fat and low-calorie, then choose lighter types of fillings. 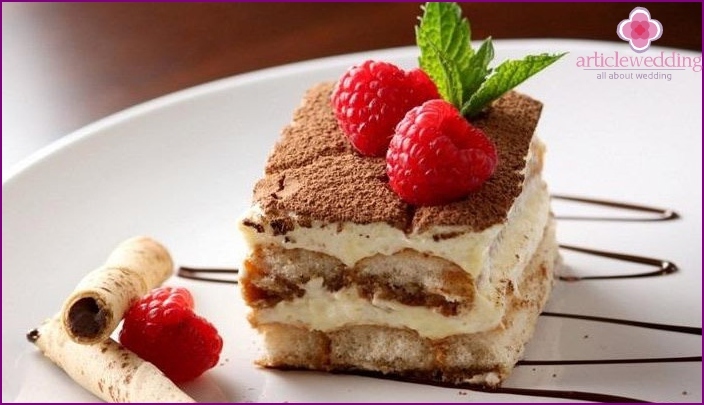 Classic tiramisu - a well-known Italiandessert consisting of several layers. 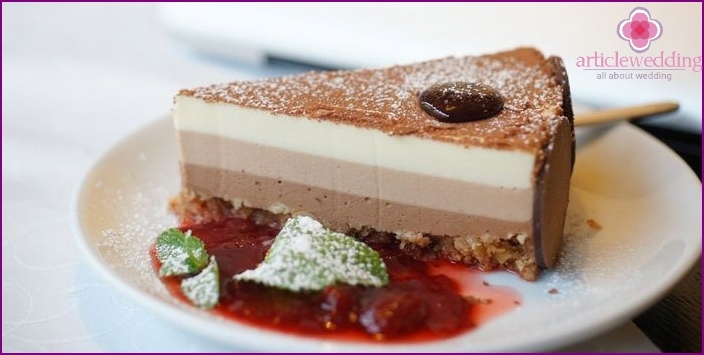 The composition of the original recipe includes mascarpone cheese, liquor "Amaretto", which is impregnated with biscuits "Savoyardy", eggs, powdered sugar and espresso coffee. 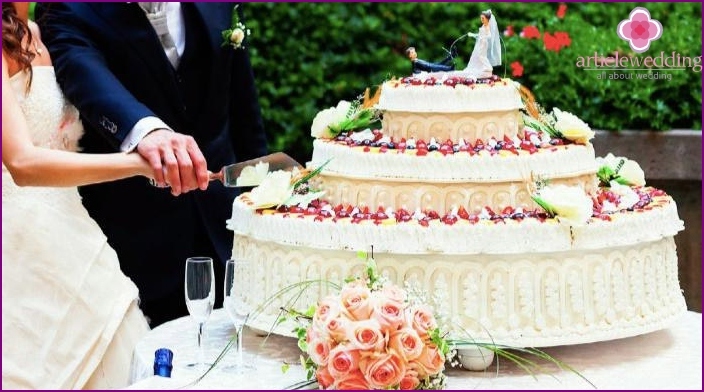 Some bakeries offer the newlyweds make the wedding an original confectionery structure consisting of small cakes "Tiramisu". They are spread in several layers, giving the shape of a wedding cake. This dessert will appeal to many visitors, it is light, airy and a pleasant sweet taste. 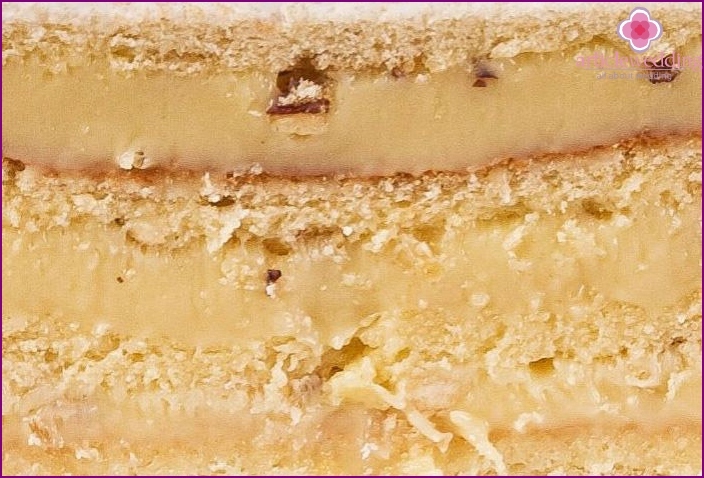 If you do not want to do the individual a la cartebaking options and seek to order a holistic multi-tiered cake on a stand, then filling it can also use a variation of the cream "tiramisu". In this case, separately baked sponge cakes that are impregnated with the liquor and coffee. Each cake is covered with layers of mascarpone cream and whipped cream. Decorate the cake with chocolate crumbs, cocoa powder, berries. The popular liqueur "Baileys" like many people,especially women, so the wedding cakes with taste of this drink will impress even gourmets. The basis for this kind of dessert, take a chocolate biscuit cakes that need to infiltrate a small amount of liquor. Stuffing make several kinds of mousse: first - praline with crispy wafer crumbs; second - "Bailey" in white chocolate with a drink. Between the layers of mousse laid jellylayer. To this end, it decided to use a peach jelly, which is optionally substituted with lemon, pineapple, cherry or other views. Since this cake has a low resistance load, it is used only for the upper tier. Strong bright flavor stuffing cake makes an excellent final chord of the wedding celebration. This option baking loversthe eponymous chocolate bar "Snickers". Biscuit alternates with hearty fillings: Korzh meringue, caramel fudge layer and a layer of cream with condensed milk, butter and lots of chopped roasted nuts (peanuts, walnuts, hazelnuts, almonds). The top layer is covered with walnut melted dark chocolate. 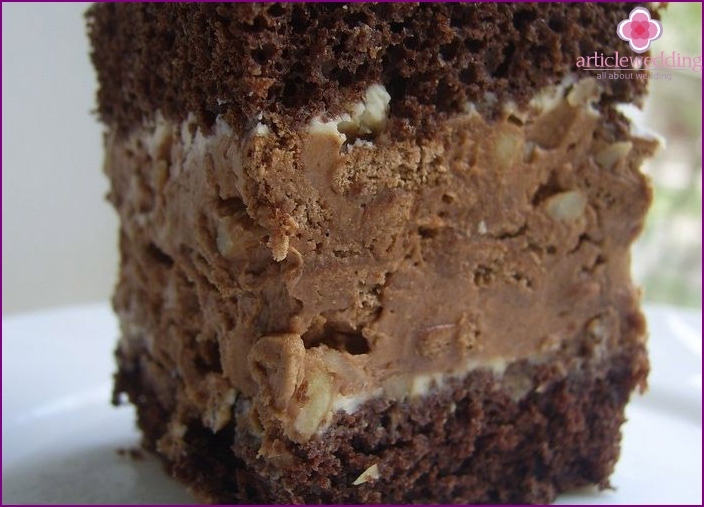 By selecting "Snickers" cake for the wedding, you mustto understand that it may seem overly hearty and heavy. Although a layer of meringue delicious, but when cut it crumbles and spoils the appearance. Treating those present at the ceremony, "Snickers" guests, make sure that there are no allergies to nuts at each of them. But this cake is highly resistant, making it ideal for creating a multi-tiered confectionary designs. Lovers of chocolate baking recommendedturn his gaze on the toppings "Three chocolate". Great combination of three kinds of chocolate mousse and delicate sponge cake will cause delight your taste buds. Prepare stuffing mousses based on quality Belgian chocolate: bitter, milk, white. On the biscuit spread bitter mousse, then milk, then white. Korzh wishes impregnated with Cointreau liqueur or a sweet syrup (banana, coconut, vanilla or honey). Multi-colored filling looks nice in the section. 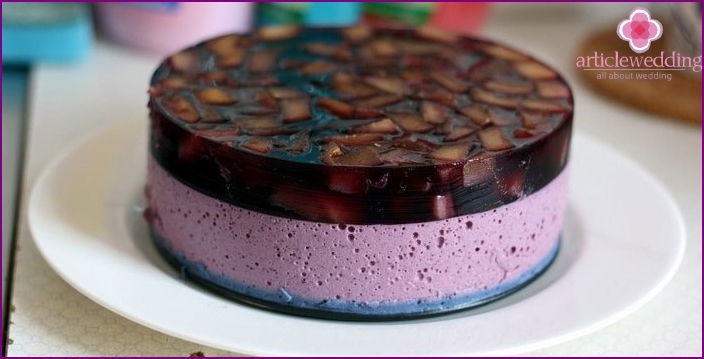 Mastic - popular confectionery material,which is used to decorate cakes. Mastic can be of different colors, with the addition of its constituent colors, it can help create beautiful decorations sweet for dessert. Among the ingredients for the preparation of this paste contains powdered sugar, egg white, marshmallow - products which, in contact with fatty creams wet can ruin the appearance of the mastic and the whole cake. Therefore, not every bakery is suitable for processing by a mastic without pretreatment. Mastic adhesive qualities biscuit, honey, sandDessert. But the desserts with a delicate soufflé or mousse on the type of "Bird's milk", "Three chocolate", "Baileys" must first be strengthened, so as not to damage the delicate structure of the filling. For this soft stuffing around similarity baskets create a thin layer of sponge cake and then coated with a special cream paste. Almost all of the cakes after this treatment suitable for processing by a confectionery paste. What toppings go well with cakes, coated with mastic? Fresh fruits and berries decorate any cake, but ifthey were added also in the filling, it ensures a beautiful summer wedding flavor baking. The berries are added as fillers to the basic cream or as prepared fruit soufflé, which sandwiches the selected cakes. The more fresh fruit is used in the decoration of the dessert and the more attractive it will be to look at the wedding. Berry mousse or soufflé for wedding cakeslaid on the air sponge cakes, which are impregnated with a sweet syrup, liqueur, brandy. Choosing confectioner and baker specify what sweet paste they use when cooking. Quality good cake to be made without the use of fruit pastes in industrial production. Delicious dessert will be only one, in which the filling is added berry puree homemade cooked by hand, without the addition of dyes, chemical thickeners, stabilizers. Choice of fruit and berries for filling dependsthe taste and wishes of the newlyweds. Many people like the classic combination of strawberry and banana, orange, lemon, cherry and plum, apple souffle with slices of kiwi. For a winter wedding is well suited cakes with mandarin jelly for summer celebrations choose the stuffing with raspberries, blackberries, blueberries, peaches. Light sweet toppings for desserts selectionMost brides to grooms. Even after a heavy feast no visitor will not be able to give up a piece of cake with a delicate layer of air. 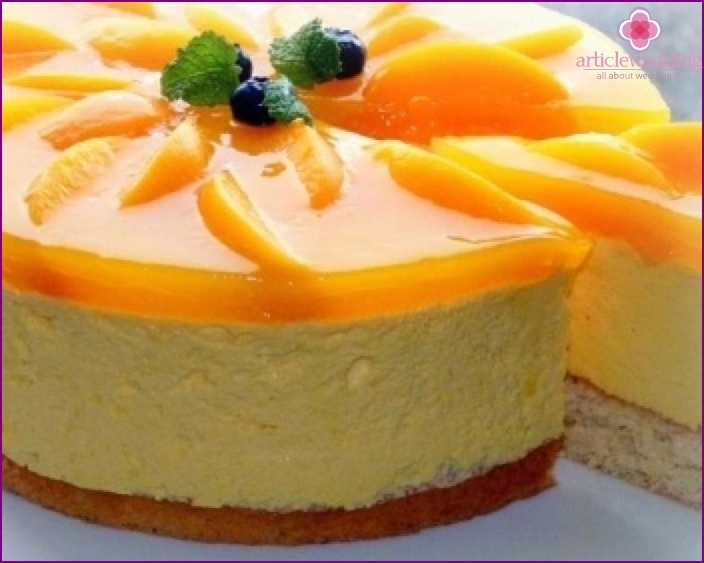 Cottage cheese, yogurt fillings are perfectly combined with most types of cakes. They are well suited for both biscuit and poppy for cakes, pastries flavored with truffle. Many couples choose for their holiday traditional cheesecake, complete with fruit. Yoghurt mousse for cakes are also prepared with berry fillings. Desserts with a stuffing - a win-win for the wedding. Sour cream is loved by many. 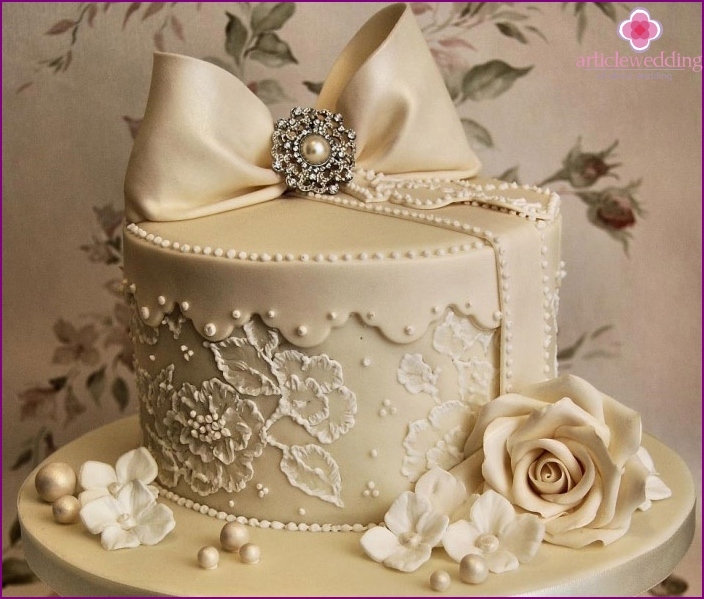 To the cake for the wedding was not unpleasant acidity, it is necessary to use fresh cream, fat content not less than 30%. Please note that the sour cream in the heat quickly deteriorates. 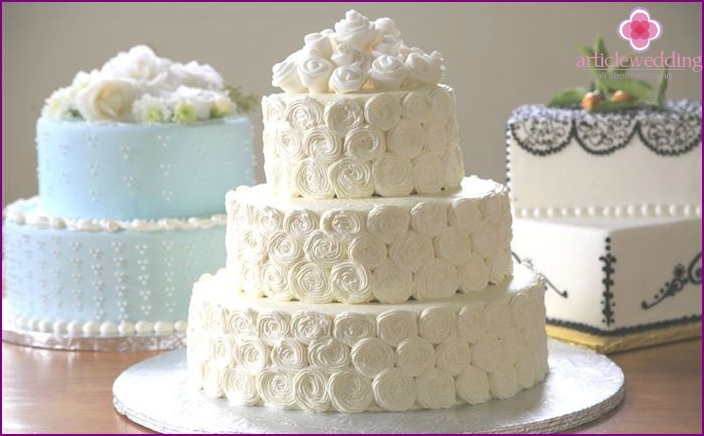 For a wedding in the summer cake with cream it is recommended to prepare not earlier than 12 hours prior to the celebration, and the finished product is stored in a cool place. Making nobility sour cream to help the berries and fruits. Classic cake "Napoleon" is also preparing for the wedding, adding him sour cream custard with dried fruits. Cream Cream is prepared on the basis of the whipped fatcream. To this was added various fillers: fruits, nuts and berries. 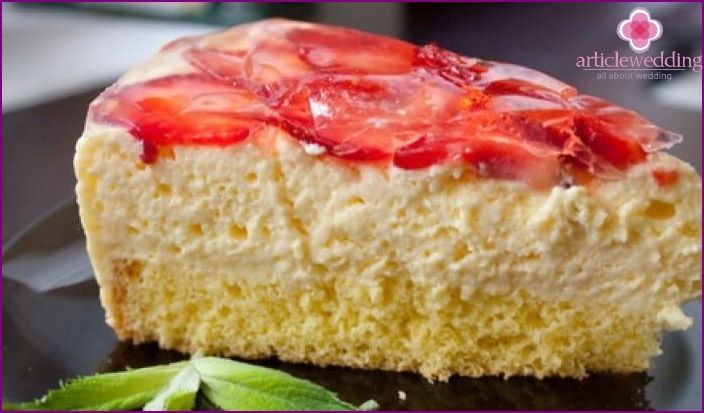 Delicious beyond filling thickened with whipped cream, coupled with cream cheese like "Philadelphia" or "mascarpone". 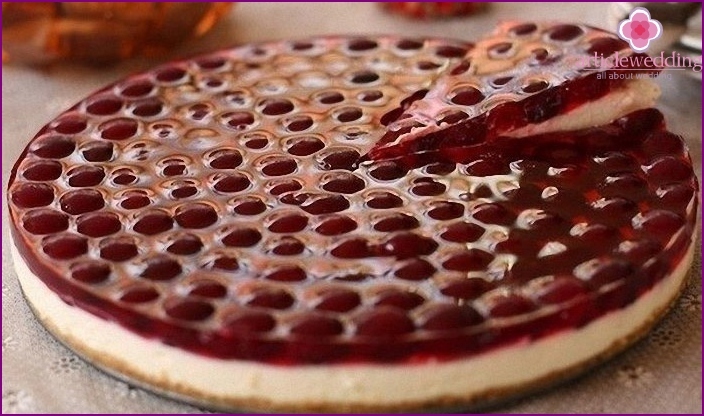 These cakes are not only delicious, but also beautiful look in the section. Butter cream is impregnated not only biscuits, but also other kinds of cakes (sand, puff, honey). a few drops of rum essence. In a saucepan pour the water and bring it to a boil. When the water has cooled slightly, pour into it the gelatin, stir and leave to swell. Separately, mix the yogurt with fruit syrup. Add to the mix the sour cream. With immersion blender to whip the yogurt and sour cream until fluffy mass. Enter the condensed milk and beat up more times. Add ingredients to a few drops of rum essence, which is optionally replaced tablespoon berry liqueur, brandy or rum usual. Continuing to whisk the yogurt and sour cream with a mixer at low speed, gradually introduce ostuzhennoy swollen gelatin. Beat the mixture until a homogeneous mass of lush. At the bottom of the split form to place advancecooked and cooled cake (cake is desirable, but it is possible and other). Over it distribute the weight of yoghurt. Top cover with foil or cling film. Send cake to cool until thickened soufflé. Garnish with fresh berries.